LASC is proud to announce that it will be hosting a public talk with Colombian lawyer and human rights defender Rommel Durán Castellanos as part of his European tour. Rommel has worked extensively throughout Colombia, defending the rights of its most vulnerable citizens in the face of extreme violence and intimidation. 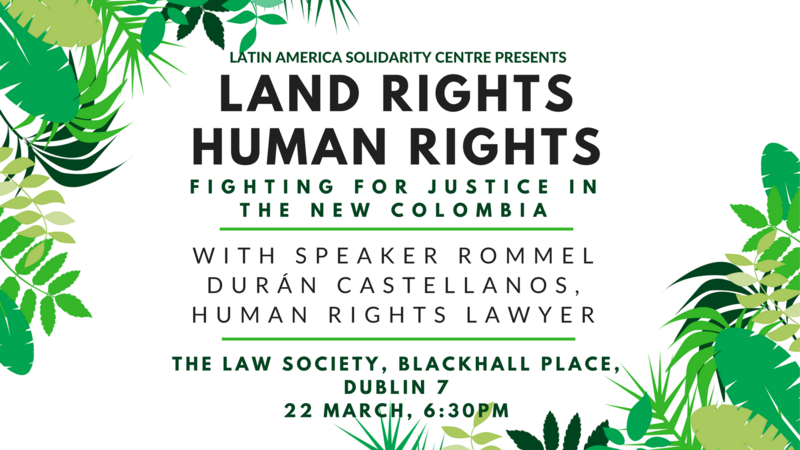 His talk, on the situation on the ground in Colombia and the deep connections between land rights and human rights, will provide an engaging insight into these issues, and will be followed by Q&A with attendees. Across Latin America, millions of people who have been forced from their homes are clamouring to return. Nowhere is this trend more pronounced than in Colombia – home to 5 million internally displaced persons who are forced to contend with illegal expropriation, violence, and intimidation in their struggle to return to their lands. Many of these people depend on the advice and assistance of organisations like the “Pueblos” Legal Team, where Rommel is a member. Through defending, accompanying and supporting smallholders and community groups, people like Rommel play a vital role protect vulnerable people, but also place themselves at great risk. Sadly, Rommel, who survived an ambush in December 2013 and arbitrary imprisonment and torture in August 2014, is not an isolated case, but part of a worrying trend of violence against human rights defenders in Colombia and Latin America.